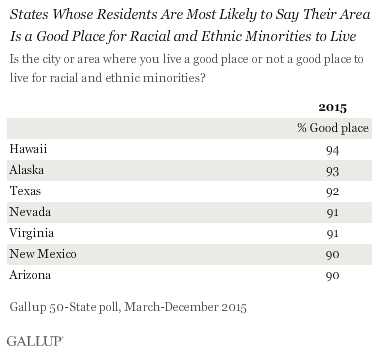 PRINCETON, N.J. -- Ninety-four percent of Hawaii residents say their city or area is a good place to live for racial and ethnic minorities, the highest of the 50 U.S. states and the District of Columbia. Other states in which at least nine in 10 residents have a positive view of how hospitable their state is for minorities are Alaska, Texas, Nevada, Virginia, New Mexico and Arizona. These results come from a Gallup 50-State poll conducted from March-December 2015, with at least 500 residents in each state. The full results for each state are shown at the end of this story. Statistical analysis shows that attitudes about minorities are clearly related to the actual demographic makeup of the states. In particular, the seven states whose residents are most positive about the environment for minorities all have above-average minority populations. Hawaii -- the most prominent example -- has the lowest percentage of non-Hispanic whites (23%) of any state in the union according to census data, meaning over three-quarters of that state's residents identify their race as something other than white, or identify their ethnicity as Hispanic. Less than half of the residents of two other states -- New Mexico and Texas -- are non-Hispanic white, and both of these states are above average in residents' positive attitudes about minorities. Residents of West Virginia are least likely to believe (74%) that their place of residence is good for minorities. Other states with a below-average percentage positive about the climate for minorities include Missouri, Wisconsin and Arkansas. West Virginia's population includes relatively few minorities; the census classifies 93% of the residents of the Mountain State as non-Hispanic white, the third highest of all states. Missouri, Wisconsin and Arkansas all have above-average white populations as well. 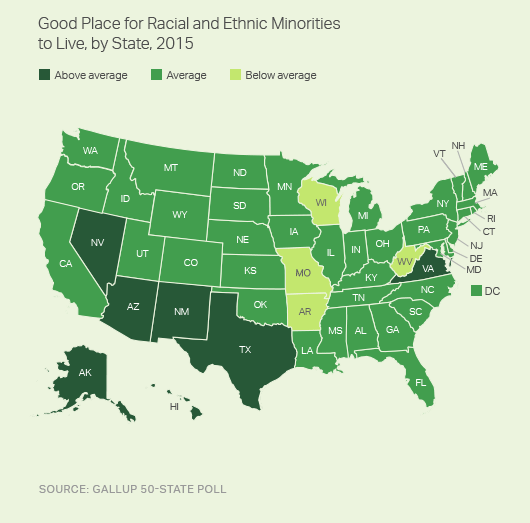 Despite state-level differences in these attitudes, residents of all 50 states are generally positive that their place of residence is a good place for minorities -- as was the case in Gallup's initial 50-State poll in 2013. State-by-state differences in Americans' attitudes about the climate for racial and ethnic minorities have been quite stable over the past three years. The top three states on this year's list -- Hawaii, Alaska and Texas -- were also the top three states in 2013. And three of the four states that are lowest on the 2016 list -- West Virginia, Missouri and Arkansas -- were at the bottom of the list three years ago. Americans generally remain positive about their local city or area as a place for racial and ethnic minorities to live, as was the case two years ago, and residents in states with the most minorities tend to be the most positive. In states like Hawaii and Texas, non-Hispanic whites are themselves a minority group, with well over half of state residents identifying their race and ethnicity as something other than non-Hispanic white. This makes it perhaps not surprising that these states' residents would say their state is a good place for racial and ethnic minorities. But even in states whose residents are mostly non-Hispanic white, clear majorities say they believe their state is a good place for minorities. Additionally, it takes only a few individuals to create a hostile situation for minorities, even if most residents of a state perceive themselves as welcoming and positive. Seventy-six percent of Missouri residents, for example, say their state is a good place for minorities. That leaves plenty of Missouri residents who perceive their local area as having a poor environment for minorities -- some of whom may live in and around the St. Louis suburb of Ferguson, or are responding in terms of the racial unrest in that city. Many Americans may feel it appropriate to indicate that they view their area positively on this measure, and other research shows that non-minorities are typically more positive about race relations than minorities themselves. In addition, although the measure reviewed here is quite positive in general, a long line of social science research shows that self-reported attitudes about race do not always predict actual behaviors.